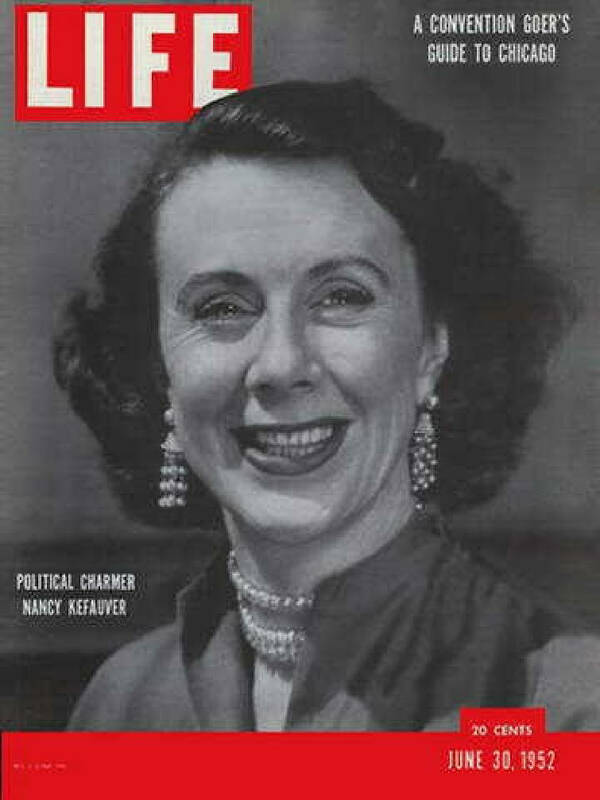 When a broadly smiling Nancy Kefauver appeared on the June 30, 1952, cover of Life magazine, with the headline "Political Charmer Nancy Kefauver — A Convention Goers Guide to Chicago," Chattanoogans probably weren't surprised. Estes Kefauver, her husband who was running for the presidential nomination, called her his "secret weapon." Despite Nancy's charm, her husband didn't get the nomination, but four years later in 1956 he was selected as Adlai Stevenson's running mate against Dwight Eisenhower, who won a second term. Some said that if the ticket had been reversed, the Democrats might have won. Kefauver was practicing law in the Chattanooga firm of Chambliss, Sizer & Kefauver when he met Nancy Pigott, who was visiting her aunt, Mrs. John L. Hutcheson, in the summer of 1934. Born near Glasgow, Scotland, on Jan.21, 1911, to Stephen Pigott, a marine engineer from New York and Mary Lewis of Tennessee, Nancy was a talented artist who had studied art in Glasgow, London, and then in Paris for two years with Andrew Lhote of the School of Paris. The Kefauvers became the parents of four children and lived primarily in Washington after he was elected to the U. S. House in 1939. In 1948 he was elected to the U.S. Senate where he served until his death in August 1963. Nancy declined to run for her husband's Senate seat, but she did not refuse three months later when President John F. Kennedy appointed her to be the first director of the newly established Art in Embassies (AIE) Program. It was Kennedy's last presidential appointment before he was assassinated on Nov. 22, 1963. This global visual arts program first conceived by the Museum of Modern Art was formalized under the U. S. State Department when Nancy Kefauver became director. Her international background as the daughter of Sir Stephen and a native of Scotland educated in Europe, and her outgoing personality, made her the perfect ambassador. Her goal was to replace the bare, white walls of U. S. embassies around the world with work by American artists. The cultural implications were enormous — Arnold Glimcher of Manhattan's Pace Gallery recalled that "Before American Art became so interesting to intellectuals everywhere, it [the U.S. Embassy] was the one place in Africa, Eastern Europe and elsewhere that American painting could be seen." Nancy Kefauver threw herself into the project, which was enthusiastically embraced by art lovers, although some conservatives expressed doubt about modern art representing American values. "It was as though we were working in the Middle Ages, the whole cultural and governmental climate was so totally different," recalled former Smithsonian and Corcoran Gallery director David W. Scott in 1990. "It was at a time when we were still fighting the battle of whether modern art was seditious or evil or un-American." It was Scott who helped Nancy Kefauver start the program, providing two basement rooms for storing and displaying the art to ambassadorial couples. At first there was only a small budget, a staff of two, and no in-house collection. Critics, supporters and perhaps even Nancy, would have been astounded by the success of the AIE program by the time it celebrated its 50th anniversary in 2013. Secretary of State John Kerry praised its "active diplomatic role by creating meaningful cultural exchange through the visual arts." The statistics are impressive. At the 50-year mark, Kerry described the AIE as "a public-private partnership engaging over 20,000 participants globally, including artists, museums, galleries, universities, and private collectors [at] over 200 venues in 189 countries." The AIE sponsors an American Artist Lecture Series and hosts art contests and shows at embassies around the world. It also awards a Medal of Arts to outstanding American artists; recent recipients include Maya Lin (2015) and Jeff Koons (2013). On Nov. 20, 1967, only four years after her husband died in August and President Kennedy was assassinated in November 1963, Nancy Kefauver collapsed at a formal dinner at the Mayflower Hotel awaiting a dinner speech by President Lyndon B. Johnson in honor of Sen. Everett Dirksen. Her husband's cousin, New York lawyer Malcolm Foshee, had accompanied her to the dinner. He saw that she was taken to a room upstairs where medics were summoned, but they were not able to resuscitate her. She was buried next to the husband she had married in Scotland on Aug. 8, 1935 in the cemetery of his family farm near Madisonville, Tenn.